Free continental breakfast private beach access and shopping casinos and restaurants within walking distance are some of the features of the Big Pines Mountain House that make it a popular pick among our guests. With a pleasant heated outdoor pool area and a property graced with mature pine trees the two-floor pet-friendly Big Pines Mountain House offers guests a relaxing refuge. All 70 rooms (non-smoking available) feature cable TV with HBO microwaves and mini-fridges. Some rooms have fireplaces and kitchenettes. A complimentary continental breakfast is offered in a lounge with mountain lodge decor and a fireplace. Guests can exercise in the on-site fitness area or take advantage of private beach access a few blocks away. 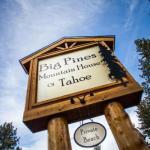 Located off Highway 50 the Big Pines Mountain House is less than a half-mile from Stateline casinos and shopping movies and restaurants at Heavenly Village where the famous gondola provides a thrilling ride up to the Heavenly Mountain ski area. The beaches of Lake Tahoe are a half-mile away. Reno-Tahoe International Airport is 55 miles north.